It you have not listened to our series, Redemption from the Curse, I suggest that you do. In 10 podcasts, we delved into the subject in some detail. In this podcast, we concentrate on the fact that Jesus BECAME the curse in our place when He went to the cross. He did that in order to redeem us. The curse that came into the earth, that foul and destructive curse that has caused ALL human misery throughout the ages, was what Jesus took in our place when He died on the cross. That is one of the central truths of redemption, but one that has been watered down or misconstrued in much of Christianity. Becoming a curse is not the same as “carrying” the curse as a load. Carrying and BECOMING are two very different things! Something happened on the cross that religion has overlooked for centuries. It was a complete and absolute substitution in our place, but it was also a full identification with the curse. He became what we were so that we could become what He is now! (1 John 4:17; 3:2) He BECAME the curse as He made Himself subject to it in order to redeem us from it. That is the central truth about this line in Galatians 3:13. 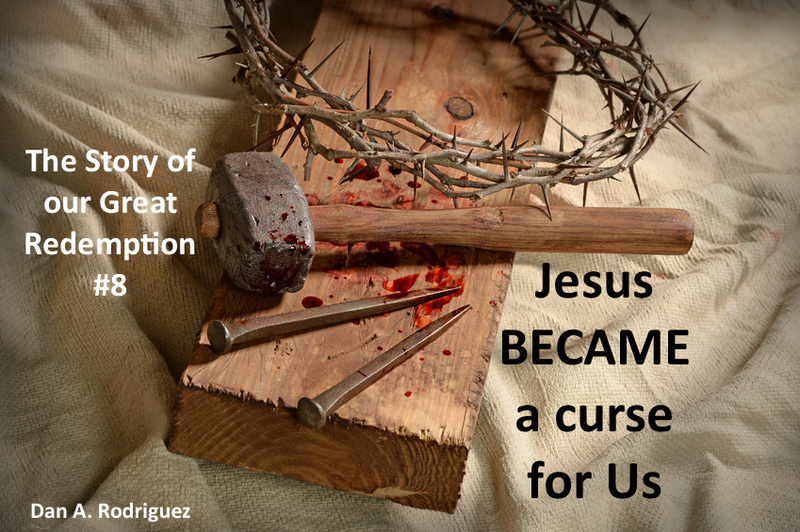 Jesus’ voluntary submission to the curse by becoming or being MADE the curse (as translated in the KJV), paved the way for our freedom. Be mightily blessed through this anointed Word! Download the free book that was the basis for most of this study, “The Story of our Great Redemption: Beyond Human Imagination!” That's the link to get the free 194-page book. I've published five different versions on this subject since 1977. The latest 2013 version in Spanish,“Tres Días y Tres Noches en el Corazón de la Tierra” is 290 pages long. That is the most complete version I have published. In its pages are many of the extra things I brought out in these podcasts that were not in previous versions. Get the free "Tres Días..." PDF here. Glory to God!